When the sun's blazing down, there's nothing nicer than a frosty beer on Brighton beach. 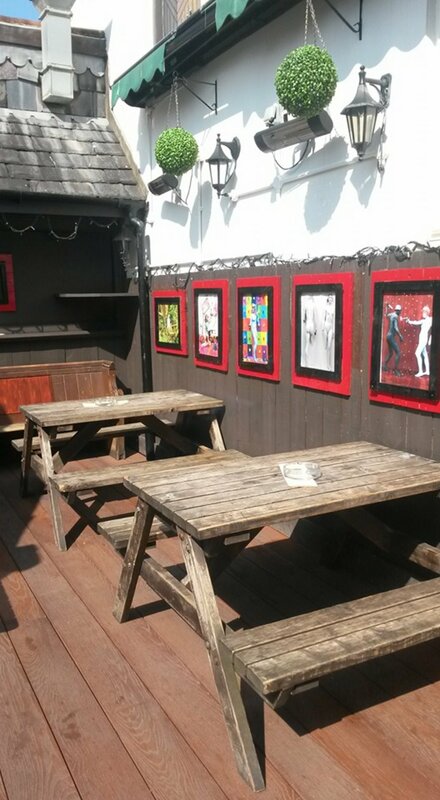 But if you want to escape the hustle and bustle of the prom in summer, why not refresh in one of Brighton's brilliant rooftop beer gardens? Image credit: The Grand Central. Situated on Surrey Street, moments from Brighton station, The Grand Central is a well-loved hotspot for city folk who come for a final farewell beer before heading back to the Big Smoke. But little do out-of-towners know that hidden above the charming 19th-Century pub is one of Brighton's best-kept secrets. The Grand Central's secluded roof terrace is shaded by tropical palm trees, decked out with colourful garden furniture making it the perfect spot to kick back with a Rum and Ting and relish the late-afternoon sun. Another hotspot I'm rather reluctant to tell you about is the rooftop terrace on Bohemia, a chichi bar and kitchen on Meeting House Lane just off the seafront. Staggered over three floors, Bohemia has a hip Berlin-style interior with exposed brick and reclaimed wood, but on the top floor is a little bit of St Tropez. Bohemia's Champagne roof terrace is sponsored by Veuve Clicquot and is about as swish as they come. Lined with fake grass, glass walls and Veuve-yellow umbrellas, the terrace boasts 360-degree views of Brighton's rooftops. If you can't stretch to a bottle of the yellow-label fizz, try Bohemia's legendary Rock and Rhubarb cocktail for a real taste of the seaside. Image credit: The Lion and Lobster. Tucked away off Western Road on the corner of Sillwood Street and Bedford Place, The Lion and Lobster is one of Brighton's oldest boozers. I used to frequent its hallowed halls many years ago when I was a fresh-faced, cider-and-black drinking student looking for a late licence or a cracking Sunday roast. Inside is a warren of hidden rooms, nooks and crannies, and it takes several visits to really get a handle on the pub, which is why I've only recently discovered the joys of its secret gardens. 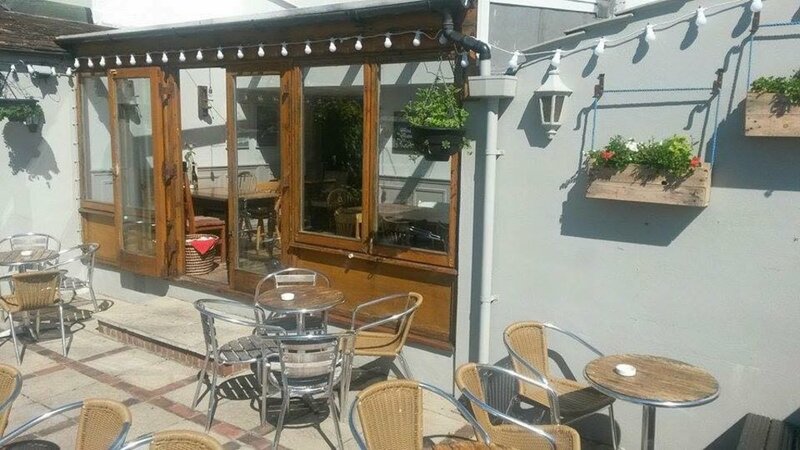 The Lion has various outdoor areas including a brilliant two-storey terrace with a bar and a wood-burning stove for when our English summer shows its true colours. Image credit: The Setting Sun. While it's not a roof garden as such, the Setting Sun's glorious sun-trap terrace is a rather special place and definitely deserves a mention. Situated on Windmill Street in Hanover, a 10-minute walk from the seafront, the view from the terraced garden stretches all along the coast from the British Airways i360 to Shoreham and beyond, and on a clear day those with eagle eyes can see as far as the Isle of Wight. For us locals, it's the Pride of Hanover and the perfect place to grab a cool pint of San Miguel and watch the sun set over our beloved seaside city. 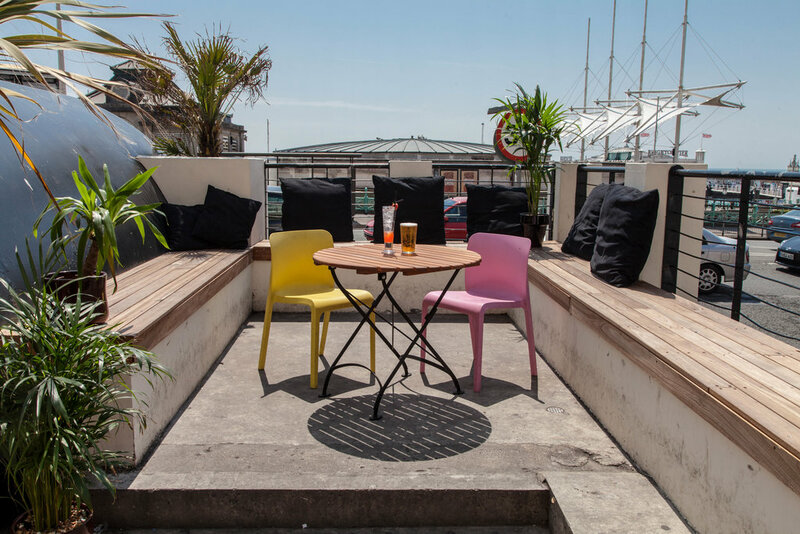 If you can't quite stretch the budget to that beach club in Ibiza, then the summer terrace at Patterns bar and club on Marine Parade is easily the next best thing. The chic white-washed roof terrace is lined with palm trees and candy-coloured trappings and has a view of both the sea and Brighton Pier, and is the ideal spot to bring 'Beefa' to Brighton with icy vodka-lemons and some banging summer tunes from the city's best DJs. And don't miss Patterns' bottomless boozy brunch with unlimited Prosecco or Bloody Marys every weekend. Want to check out Brighton's best rooftop bars for yourself? Look out for our Brighton hotel deals and start planning your next seaside adventure.